RESPMED Home care Unlimited Inc. offers home health care medical supplies and equipment in El Paso area since 1996. 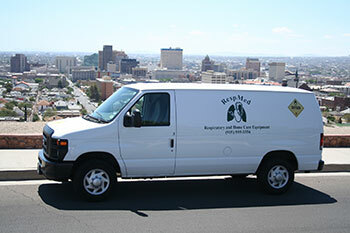 Locally owned and operated, RespMed provides clinical respiratory services and home medical equipment for the adult and pediatric populations in El Paso, Texas. RespMed enjoys the reputation as one of the most expert, accomplished, and seasoned home medical and oxygen firms in the community. RespMed opened its doors for business on January 30, 1995, and experienced 80% growth during its start-up phase, thanks to talented, medically-expert leadership, and good service and compliance practices. During the intervening years, RespMed has continued to supplement this growth with new program offerings such as the community's only pediatric Sleep Apnea Monitor Program, an ever-increasing commitment to the optimum in patient care, and adherence to the most stringent compliance standards. Our success is testament to our excellence in these regards. RespMed has been accredited by the Joint Commission on Accreditation of Healthcare Organizations (JCAHO) since 1996. JCAHO utilizes developed, standardized health care quality controls in surveying, auditing, and inspecting health care facilities on an annual basis. At each survey, it is determined how well the facility meets those standards. Specifically, JCAHO looks to see how health care organizations continuously improve the safety and quality of the care they provide to the public. JCAHO is voluntary, but is considered the most rigorous audit in the healthcare industry, and JCAHO accreditation is needed in order to bill entities such as Medicare and Medicaid. RespMed is proud to have kept its accreditation in good standing since its first survey in 1996. RespMed is one of the very few locally owned and operated durable medical and oxygen companies in El Paso that is JCAHO-accredited. During RespMed's 2005 JCAHO audit, we became clinically accredited, thanks to our excellent staff of respiratory therapists, compliance team, and service professionals. This means we can now provide more services than ever to individuals needing advanced oxygen care services. In summary, RespMed's specialized, distinguished credentialing, unique services, and, most importantly, obsessive interest in patient care and intelligent attention to patient needs, makes RespMed the obvious choice for your durable medical equipment and clinical oxygen service requirements. Thanks for visiting our website, and please allow us to meet your needs! RESPMED Home Medical Equipment has earned the Joint Commission's Gold Seal of Approval!